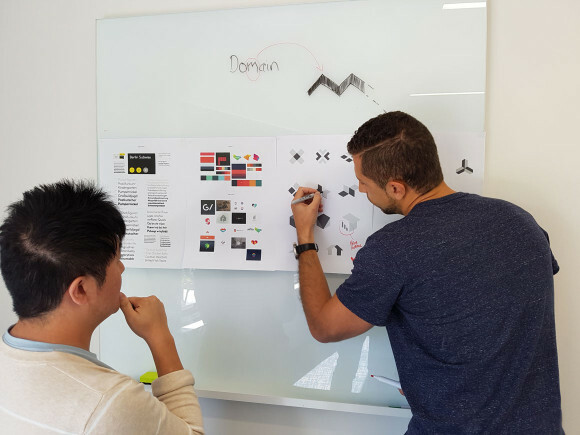 David Meier, head of design at Domain Group, was tasked to create six company identities – each unique on its own yet unified as a brand – in six weeks. He takes us through the design journey and outlines the challenges his team faced. Design is a core element of brand perception and, for designers, the challenge and opportunity often lies in the fact that businesses are not static. They change; gaining people, products, and goals. As businesses grow, their identities evolve alongside their offerings. The role of the designer is to take these new additions and give them life… while maintaining a distinguishable identity and a sense of consistency. Sounds simple, right? This is the challenge I found myself tackling when Domain Chief Editorial and Marketing Officer, Melina Cruickshank asked if I could create six company identities in six weeks. Yes, we’re a real estate platform, but design is at the heart of everything we do, and at the risk of sounding like a cliché – I can happily say we’re a design lead organisation. The importance and value of putting our users first is echoed throughout the company all the way through to the executive team. We don’t simply design products that look great – we craft experiences that put our 3 million+ users at the centre of our design process through research, user interviews, split testing and data analysis. When Domain acquired five new businesses: Commercial Real Estate, allhomes, MyDesktop, APM, Price Finder, it also acquired businesses that had organically grown with minimal design influence. Over the last twelve months the product offerings of these businesses have significantly evolved with a much stronger focus on the user experience. The original identities lacked consistency, with no distinguishing features tying the brands together, and nothing tying them to the Domain Group. Our task was to reimagine the visual identities for each brand to reflect the product propositions, while also demonstrating unity across the Domain Group. Initially, the task was daunting and we were ready to engage a branding agency, but it was clear that an external agency was not going to understand the unique relationships between the brands any better than our own internal design team, who have redesigned these products and work on them day in, day out. We started brainstorming how we could take these disconnected identities and somehow tie them together as a family. It wasn’t going to be as simple as refreshing them with a fresh coat of Domain green paint – we needed to create a more ingrained connection. Inspired by the idea of Material Design, Google’s design manifesto, we set out to find unity between these new brands by working with papercuttings and light. The core principle of Material Design is creating digital design defined by ideas of tactile space, where boundaries are defined by the way raw materials interact with the physical world and the core principles of light, surface and movement guide the design. We sought to uncover a set of dimensions or proportions that could be used to subtly reflect the connection of the brands. Eventually we abandoned the papercuttings, but it started us thinking and moving in the right direction. We continued to pursue the idea that geometry would be the connecting thread between the brands. 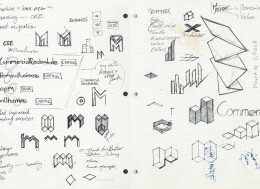 We were guided by the unique Domain visual identity, the ‘M’ mark, with the ‘house peaks’ guiding the dimensions and shape across the suite of brands. The result is a shift from flat design to stacked shapes that suggest layers and movement. Not only does this create a visual sense of connection with the original designs, the fresh visuals brings a contemporary element to the brands. Colour was also a crucial element used to transform the disconnected brands into a group identity. Domain recently released a bright and fresh update to their distinctive green reflecting the new possibilities and beginnings users can find on the platform. Rather than simply pulling the new brands into a green palette, we opted to honour each brand’s history and unique characteristics by retaining a strong resemblance to their original colours, however, the primary colours were all refreshed with a much bolder brighter palette that forms a common theme across the suite of brands. To further strengthen the connection, Domain’s secondary colour, slate, was applied to each brand. Change is difficult — it’s the reason that so many companies engage external agencies when they’re faced with a rebrand. As businesses grow and evolve, design teams must tackle the challenge of maintaining an identity that customers recognise while also reflecting the changes they have undergone. In Domain’s case, we acquired businesses that would extend our geographical reach, expand our audience profile and provide real estate agents with services to make their work easier and allow them to make more informed decisions. Domain bucked the trend by keeping the rebrand in-house because we knew that no one would understand the brand values better than those living and defining its design daily. Taking inspiration from the geometry and colour palettes of the original Domain branding, we created visual consistency between Commercial Real Estate, allhomes, MyDesktop, APM, Price Finder and the Domain parent group. David Meier is Head of Design at Domain Group, Australia’s property platform.